Brief overview of the 13th annual Plone conference. The 13th annual Plone Conference, hosted by Eau de Web in Bucharest, Romania, was a smashing success! The theme was "Plone 5: Built with Passion" to highlight the September release of Plone 5.There were close to 200 attendees, 40+ presentations, 3 hours of lightning talks, a sprint for the upcoming new Plone.org, and a lot of sprints around Plone 5 and popular add-ons. The official Plone Conference photos are available on Google+. Videos are still being processed and will be posted next week. Sign up for the Plone Newsletter to get all of the videos, photos, and slides delivered right to you. Next year Plone returns to the United States. 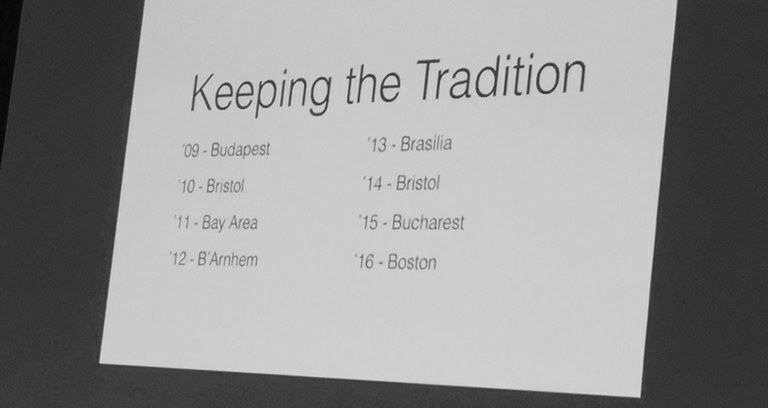 The 2016 Plone Conference will be in Boston! Thank you to Eau de Web and all of the conference sponsors!